In every year since 2005, numbers of hate crimes, beatings, and murders as a result of hate crimes have risen. At the same time, the proportion of hate crimes with subsequent conviction in the courts has also increased. The fortifications of Moscow’s Kremlin walls have weathered a turbulent history through the centuries, from headquarters of the tsars to a backdrop for Soviet military parades. Today, the signature red bricks represent a mixed legacy for a country struggling to interpret its past while facing a resurgent sense of nationalism. Virginia Tech graduate and International Studies major Aimee Fausser made it her goal as a senior to investigate the trend toward ethnically-motivated crime in Russia’s post- Cold War environment. Fausser, now attending law school at the University of Virginia, is interested in exposing a particularly troubling trend in post- Soviet Russia: hate crimes. Are these crimes rising in modern Russia? If so, how is the government addressing the problem? However, even compiling the basic numbers on Russian hate crimes—a vital step in understanding the full extent of the problem in the Eurasian giant—is extremely difficult in a society that continues to suffer from rampant corruption and, in fact, does not officially identify hate crimes as such in its records. Fausser’s research aims to document these crimes and gain an insight into a subject many in the government and, increasingly, the Russian press would rather ignore. Fausser, who minored in Russian at Virginia Tech, harnessed the knowledge of two independent NGOs, the Moscow Bureau of Human Rights and the SOVA Center for Information and Analysis, in her effort. This research strategy is not ideal, but although it is limited by incomplete or deliberately misleading official records, it may have yielded a clearer picture of hate crime trends. Because the government does not classify hate crimes in a separate category, both institutions must determine which crimes were ethnically motivated as well as using reports in the Russian media to double-check the statistics and victim counts across the country. “They’ll sometimes report it as a crime, but they’ll never report it as a hate crime. You’ll have to dig through the records and decipher which ones you think might have been racially motivated and check them with the newspapers,” she said. With decreased media coverage of ethnic violence, this task becomes even more difficult. Additionally, the NGOs themselves admit their estimates are conservative by ignoring mass brawls, crimes in the volatile North Caucasus region, and most crimes involving firearms. Fausser obtained the data first through the organizations’ websites and through personal contact for older datasets, many of which required considerable translation from the original Russian. Despite the numerous barriers to the information, Fausser discovered some significant trends. From 2004—when numbers first began to be tracked by the two NGOs—to 2008, SOVA and the MBHR recorded a 74% and 352% rise in hate crimes, respectively. Despite using varying strategies to collect data and disparities between the two organizations, the general patterns across both datasets are remarkably similar. In every year since 2005, numbers of hate crimes, beatings, and murders as a result of hate crimes have risen. At the same time, the proportion of hate crimes with subsequent conviction in the courts has also increased. Still, there are inconsistencies in the findings, Fausser readily admits. Both NGOs found either no change or a decrease in crime in their first year of collecting data, from 2004-2005, even though in the subsequent interval the numbers shot up. Fausser postulates the organizations may have found it more difficult to collect accurate data that year, although Amnesty International estimates the rate of violent hate crimes had been occurring at a similar rate to that of 2004. The second anomaly is in 2007: this year marks a decrease in number of convictions despite a continual rise in crime frequencies and consistent data collecting at this time. Fausser cites Human Rights Watch and Radio Free Europe in noting that 2007, being an election year, may have been a convenient time for the government to use xenophobia as a means of marginalizing political rivals. In fact, much of Fausser’s research found that through certain official actions—such as opting not to add racial hatred charges in existing cases where ethnic motives have been proven, and classifying other violent acts as simple ‘hooliganism’—the problem of combating hate crime is complicated by the possibility that the Russian government tolerates some crime to serve its own interests. “I think they have a fear of too much of a shift either way,” Fausser says, referring to unrest fueled by either an uncontrollable swell in racist violence or unpopular crackdowns against perpetrators. Fausser attributes political science professor Edward Weisband—her eventual honors thesis mentor— and his “Nations and Nationalities” course in sparking the beginnings of her interest in crimes against certain ethnic groups. She recalls Weisband using the Holocaust as an example to illustrate the concept of “othering” and creating fear to illustrate the concept of forging and demonizing a certain group to create fear. 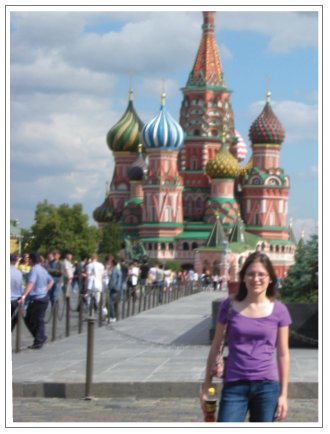 Aimee Fausser stands over Moscow’s Red Square, overshadowed by the towering icon of St. Basil’s Cathedral. However, the idea to examine ethnic crime in Russia came only after Fausser participated in a study abroad trip to the country with Associate Professor Nyusya Milman-Miller in the summer of 2008. Milman-Miller, who grew up in the USSR, casually brought the issue to her attention: several of her friends’ children, she said, looked like ethnic Georgians; they would likely be bullied in school and beaten up, she said. In her interactions with Russians while abroad, Fausser says she also encountered similar conversations regarding non-ethnic Russians, such as avoiding a market at night because there were “a lot of Georgians there.” On the other hand, a fellow group of ethnic Chinese students that were in Russia at the same time avoided going out. “They were scared to go out at night, even in groups,” Fausser said. Although she encountered difficulties in pursuing her research project, Fausser welcomes the experience that came with conducting original research that independently contributed to the larger body of work on the subject. “I think it helped me develop a lot,” she says, noting that regardless of its direction, students should not hesitate to pursue their own research opportunities: “It’s a matter of finding a professor that you work well with … Going from there, it’s a great experience to have as an undergraduate. Aimee L. Fausser is a native of Springfield, Virginia and graduated from Virginia Tech in 2009. She received her Bachelor of Arts diploma in Honors in International Studies with a minor in Russian Language and Culture, as well as a minor in Music. Aimee is currently a law student at the University of Virginia. Aimee is a member of Phi Beta Kappa, Phi Kappa Phi, and Phi Beta Delta National Honor Societies. During her time at Virginia Tech she was a College Ambassador for the College of Liberal Arts and Human Sciences, and was also active in the Young Democrats, Residence Hall Federation, Environmental Coalition, Student Advisory Council, Russian Language Club, Early Music Ensemble and Tae Kwon Do Club. She is also a member of the National Fraternity of Student Musicians, and the Japan American Society. Always interested in politics, Aimee has worked on a variety of political campaigns, interned for Congressman Reyes, Chairman of the U.S. House of Representatives Intelligence Committee and studied abroad at the RGGU (the Russian State Institute for the Humanities) in Moscow. 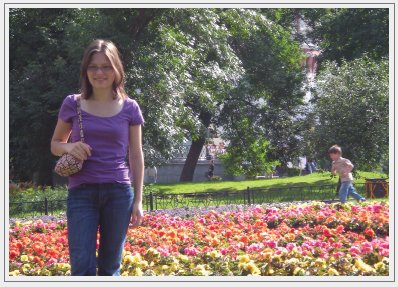 For her senior research she worked with Dr. Edward Weisband studying Ethnic Violence in Russia.